This 2 1/2 hour 4 mile tour takes you to some of the city's most famous donut shops for a taste of Portland's most delicious doughy delights - all food included! 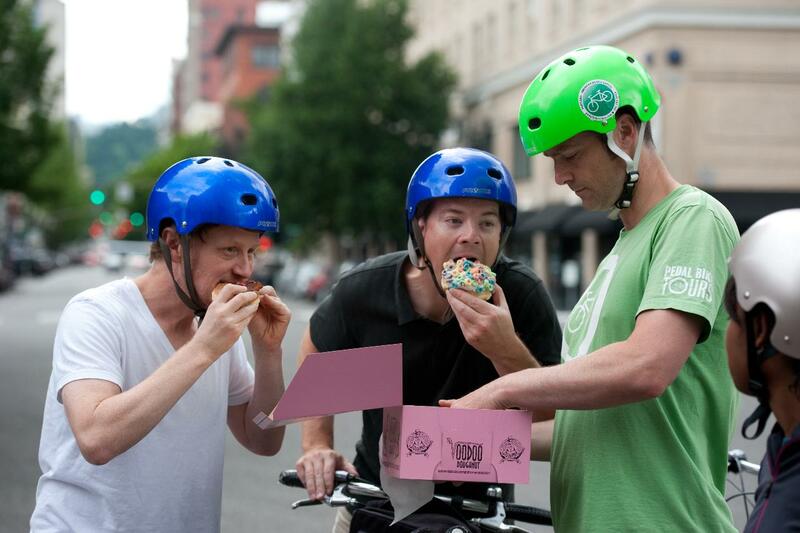 We'll cruise between 4 donut shops and ride through several of Portland's most lively and iconic neighborhoods including Old Town, Chinatown, the Pearl District, the Park Blocks, Portland State University and the scenic Portland Waterfront. Our first stop is NOLA with their rich, chocolaty layered La’ssant. The next is the deservedly famous Blue Star, where we'll sample the French brioche-based doughnut that graced the cover of Food & Wine magazine. Then on we go to local favorite Coco Donuts, which not only has scrumptious donuts but also roasts their own coffee. Then we cruise down the hill, along the river and to the most famous place in Portland, Voodoo donuts where we'll skip the line (often an hour long!) and try the notoriously delicious bacon maple bar (vegetarian option available). Now that’s what we call a morning well spent!